“Whole Blood? Seriously?” That is the reaction Dr. Mark Yazer gets when he talks about his current favorite blood product. He is on a mission to change your mind about this “old school” solution! However, around 50 years ago, we started separating whole blood into red cells, plasma, and platelets, and the age of “component therapy” was born. Hardly anyone used whole blood (except the military, where such use continued throughout numerous US combat campaigns). Dr. Mark Yazer graduated from medical school at the University of Ottawa and completed his residency in hematological pathology at the University of Alberta. He is currently a Professor of Pathology at the University of Pittsburgh, and the medical director of the RBC serology laboratory at the centralized transfusion service in Pittsburgh, one of the largest transfusion services in North America. 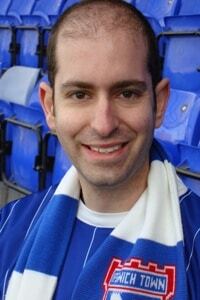 Mark is also an adjunct professor of clinical immunology at the University of Southern Denmark. He has published over 150 peer reviewed papers, and is an associate editor of the journal Transfusion Medicine and the journal Hematology. Mark is on the editorial board of 4 other journals, and is on the scientific advisory/speakers board of 7 corporations. He is the chairman of the AABB’s molecular testing standards unit, and the co-chairman of the AABB/THOR working group. Dr. Yazer has given over 200 lectures on his research worldwide. His interests include patient blood management, blood utilization in trauma, and electronic enhancements for patient safety (and don’t forget ice hockey!). DISCLAIMER: The opinions expressed on this episode are those of my guest and I alone, and do not reflect those of the organizations with which either of us is affiliated. Mark discloses honoraria from Terumo, while I have no relevant financial disclosures. The images below are generously provided by Dr. Yazer. Here in Egypt, we are used to give whole blood, and It works. I am so excited about this WWB. I currently work for the ARMY transfusion service and we start store low title wb. In the past I worked for the donor center for the NAVY. Karen, just to be clear: Dr. Yazer is NOT talking about using warm or fresh whole blood in this setting. He is referring to cold-stored, low-titer whole blood for use only in very specific situations. I listen to the podcast on whole blood because it is all we do here in our hospital in Nepal. Not only do we transfuse ABO specific whole blood, but when we don’t have enough of the same group the doctor can order other blood groups. For example not enough AB, we will give A or even O. We never do the titre, we cross-match in Saline, albumin 22% and Coombs. 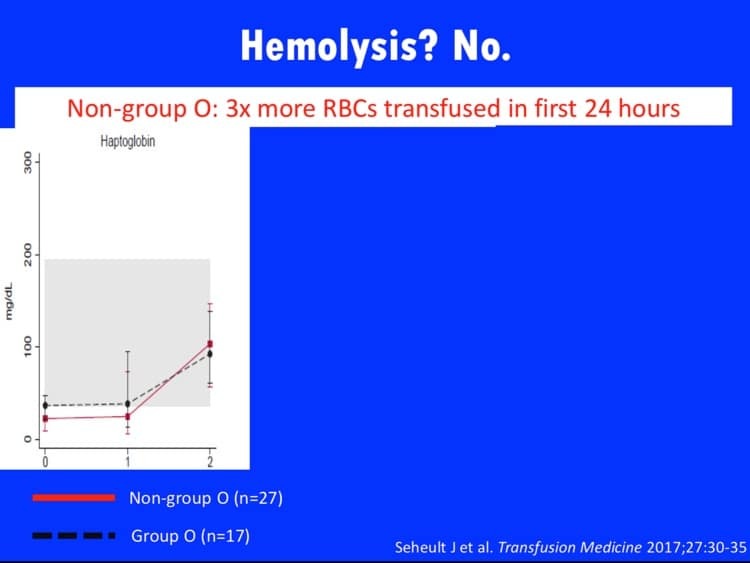 We have almost no transfusion reaction as far as I know. Listing to your podcast it sounds like what we do is wired to most people in the West. Could you comment? I don’t think what you do is weird, Marianne, it’s just different practice in different settings. In the U.S., blood banks and transfusing doctors are very accustomed to using individual components (red blood cells, plasma and different plasma derivatives, and platelets) rather than using whole blood. This has been true for us for a long time, but the available resources are different elsewhere. You are doing what you can do with the products available to you, so I salute you for doing so! I wish you the very best. Thanks for writing, and for listening in Nepal! Thanks for the great website and podcasting. 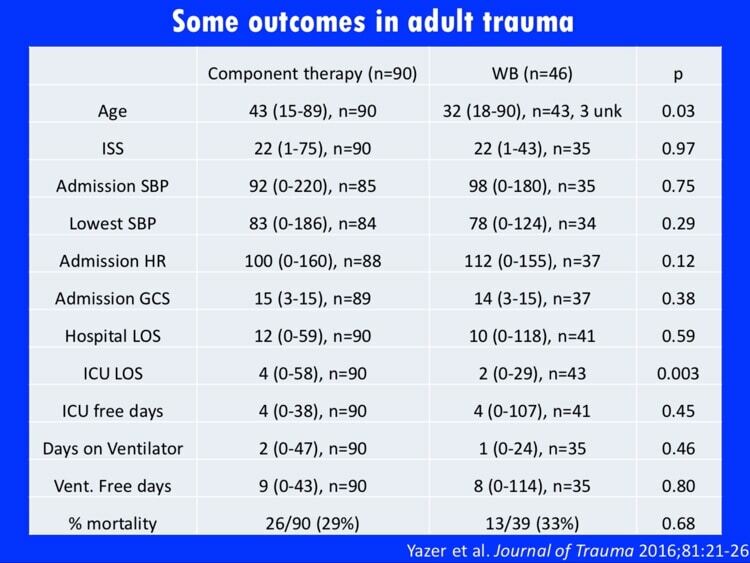 My question is in regard to the comment on using a leukoreduction (LR) filter at the bedside for whole blood during trauma: Does the use of a rapid transfusion device, or even a pressure bag affect the efficacy of the LR process (i.e. 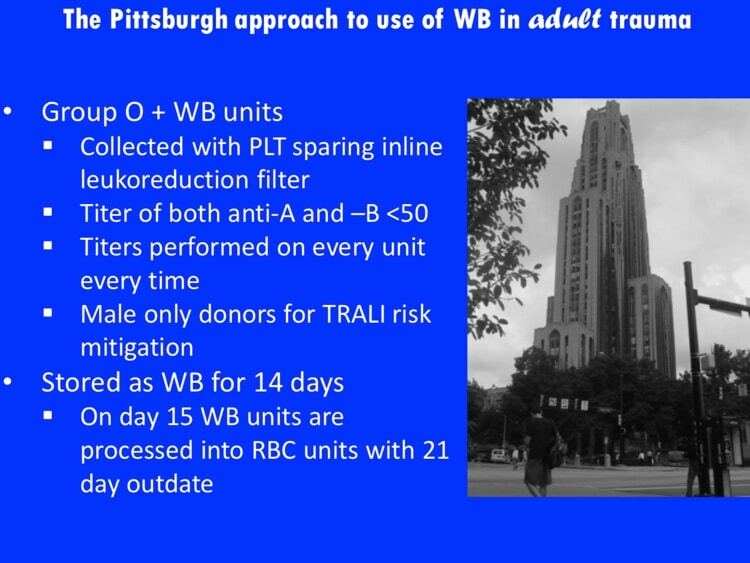 is there a rate of transfusion that limits the efficacy of filtration). We use LR filters in conjunction with cell salvage in the OR for patients with known or suspected malignancy, whereby malignant cells are filtered via the same mechanism (which I believe to be negatively charged chemoattraction?). Have always wondered if speed affects efficacy . . . ? Thanks! The use of bedside LR has mostly disappeared in the US in routine settings, as most blood centers and transfusion services feel that the process is better controlled by filtering before the product leaves either the blood center or the hospital transfusion service. The use of LR filters for cell salvage blood, on the other hand, is obviously a place where it still occurs. I can tell you that, in the past, the function of “standard” LR filters was impacted significantly when units were run through too rapidly. However, to the best of my knowledge, current LR filters designed for cell salvage applications are very capable of rapid flow. They are designed that way, and the filter should have a maximum flow rate in the package insert (one I reviewed today said up to 80 mL/min at 300 mmHg while removing 99% of WBCs). To your second question, many get nervous about using cell salvage in cancer surgeries. Historically, that was considered a contraindication. However, some studies have shown that cell salvage in cancer surgeries does not increase risk of recurrence. For the mechanism, your guess is as good as mine. There is certainly some component of chemoattraction, but there is also actual size filtration (cell salvage filters have larger pore sizes than traditional filters); the manufacturers are tight-lipped about how they actually work! Thanks for writing, and for the kind words. 1-what is the ideal titer ? You have just hit on one of the biggest problems we have: There is no universally accepted standard either for what a significant titer measurement is, or even for the ideal platform or method for testing titer! There is work going on to try and define this now, but for now, unfortunately, my answer is: There is no specific answer! You can learn what you can from groups like Dr. Yazer’s, but others might disagree (and sometimes disagree very strongly). Part of an Air Medical Group that is now carrying whole blood. Questions had arisen in the past regarding giving products to women of child bearing age as we carry O+ red cells in general and AB or A Plasma. 1. Are there any new issues regarding possible alloimmunization in this group now that platelets are in the mix??? 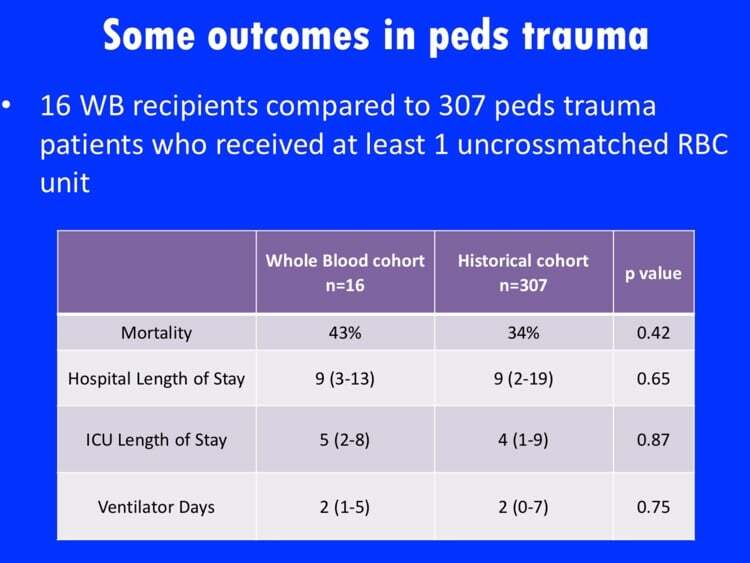 Mike, adding platelets increases the risk of RBC alloimmunization very little (if any), as there is FAR less risk of immunizing someone with platelets than with red cells. Modern-day platelets have incredibly small numbers of RBCs, so I wouldn’t really be too concerned about platelets leading to RBC alloimmunization. Put it this way: It’s POSSIBLE, but not real LIKELY. But there could be more HLA allo-immunization. So if this was a patient who was waiting for transplant, that could be a negative impact and increase that patient’s wait time. 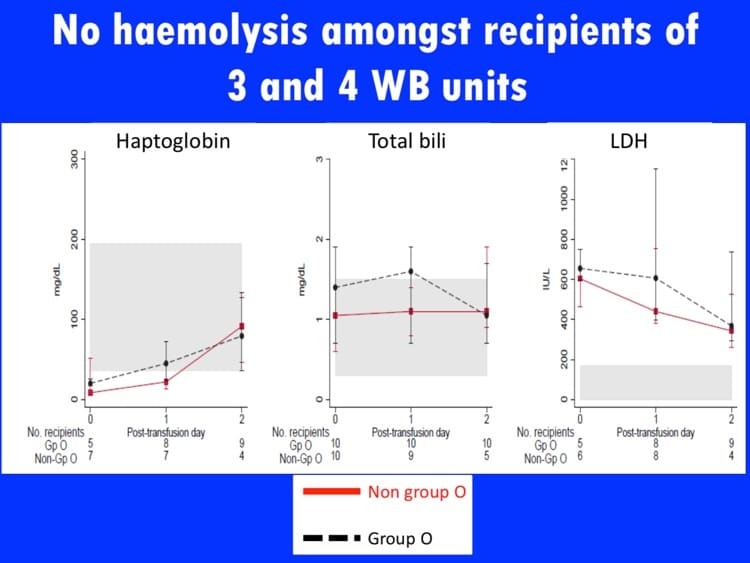 Anne, in Dr. Yazer’s lab, these units are leukocyte-reduced to levels shown to decrease HLA alloimmunization (the same levels used in the US for RBCs), so that should not be a significant concern. however I have went through this study ”Who’s afraid of incompatible plasma? A balanced approach to the safe transfusion of blood products containing ABO-incompatible plasma” and found that there is a chance for the antibody titre to increase by time as one case has reported. I think that is something that currently is up to every center to decide. Donors can change titers, yes, but usually within narrow confines, in my experience. However, in the U.S., there is no current standard on this issue. Thank you to both Drs Chaffin and Yazer for this podcast.I’m the director of a SBB program and I just used this podcast for an online discussion of the new standard 5.27.1.1 in the 31st edition of the AABB Standards for BB and TS. By the way, I also used the podcast of the latest changes in the new Standards for the SBB students too! Thanks for doing this! Thanks, Laurie! 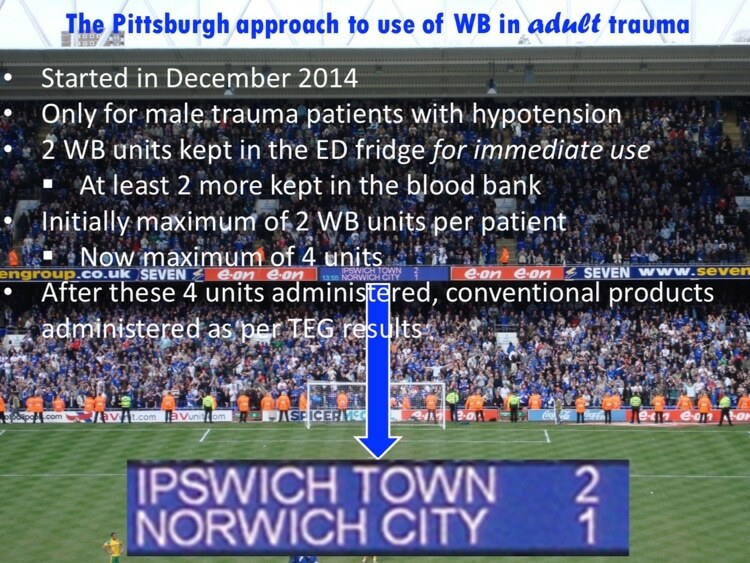 There is much discussion about this right now, as I am hearing more and more from trauma people wanting to discuss using cold-stored whole blood as Dr. Yazer outlined. I would say that most U.S. blood centers are not yet “geared up” (as of April 2018) to provide the product (it’s not as simple as saying, “we collect whole blood all the time, so we are good to go!”). I suspect things will change, however. Thanks for listening and for recommending the podcast to others! CCEMS has also been teaching Bleeding Control to police and firefighters for many year, so they can act if they are first on the scene. Since 2015, we have been teaching school district personnel and the public. Thanks, Norm. I usually don’t allow links in comments, as this is meant to be a purely educational site, but I’m allowing yours this time because it illustrates a “real world” example of how cold-stored low-titer group O whole blood is being used. Thanks for letting me know.